Where is alexandrite mined? There is virtually no alexandrite coming from Russia these days. 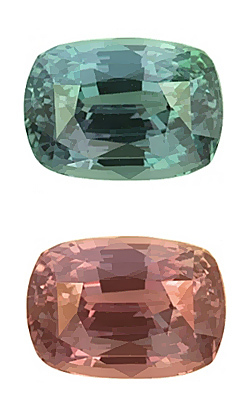 Between 1833 and 2008, Alexandrite has been discovered not only in Russia but in Australia, Brazil, India, Madagascar, Myanmar, Sri Lanka, Zimbabwe, Tanzania and the US. This list may seem long, but the production of top quality alexandrite from any of these mines has been relatively small. 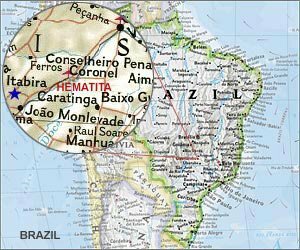 Currently, the best alexandrite comes from the Hematita mine in Brazil. Today, several labs can produce synthetic lab grown stones with the same chemical and physical properties as naturalalexandrite and these stones are more difficult to identify. Since synthetic alexandrite share the same chemical and physical properties with natural alexandrite and normal gemological tests for density and refractive index will be of little use and gemologists must use magnification to study the inclusions in order to determine the origin of the material. Synthetic alexandrite may contain curved striations, flux inclusions, triangular metallic platelets, or gas bubbles, depending on the growth technique used. Most gemstones described as synthetic alexandrite are actually simulate dalexandrite - synthetic corundum laced with vanadium to produce the color change. ... 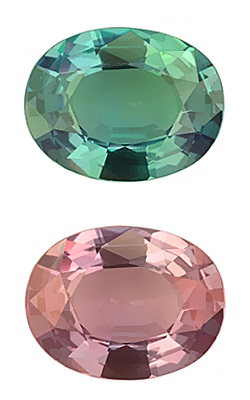 The material shows a characteristic purple-mauve color change which, although attractive, differs from alexandrite because there is never any green. Alexandrite commands a high price equivalent to or even exceeding the price of gemstones like, sapphires, rubies, emeralds, and diamonds. Alexandrite from Russia would be more valuable if their origin could be verified and if they were of superior quality. Top-quality alexandrite from Russia has sold for as much as $3000 to $10,000 for a one-carat gem. The price of alexandrite has risen in recent years due to high international demand, especially from Japan, but as a gemstone investment, alexandrite is a good choice because of its rarity, durability and distinctive historical significance. 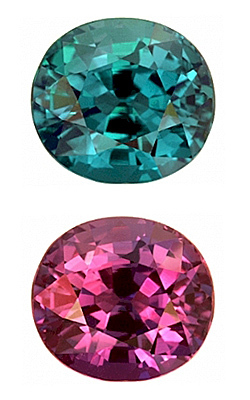 Left: Fine color change and exceptional clarity faceted alexandrite (8.66 cts) from the Tunduru deposit, Tanzania. Middle: Faceted alexandrite (2.71 cts) with distinctive color change (bluish green to medium red-purple) from Araku, India. Right:Very strong color change and good clarity fine alexandrite (3.61 cts) from Hematita, Brazil. Alexandrite is mined sporadically in the Malacacheta. Cat's-eye chrysoberyl is readily available at Teofilo Otoni, albeit in very small sizes, mostly under 0.5 ct. Alexandrite is available in smaller sizes. One excellent eye clean with strong color change alexandrite of about 5 cts was shown at the offices of Stone World in Teofilo Otoni. 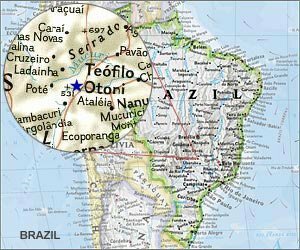 Teofilo Otoni located between the stony hills and rocky mountains that are so characteristic of the landscape of the state of Minas Gerais, is Brazil's most important commercial center for colored gemstones, where about 55 percent of the country's output is brought to be sold. 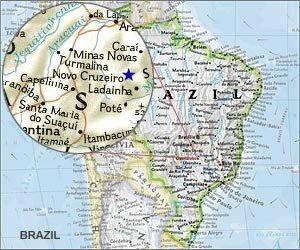 It is the beating heart of Brazil's colored gem trade, the town where production from hundreds of small mines dotting the region comes to be bought and sold. Driving through the region, it's common to see tunnels cut into the hillsides -- or, more correctly, the telltale white of the waste rock dumped outside the mine. These are all garimpeiro operations, some literally located in people's backyards. 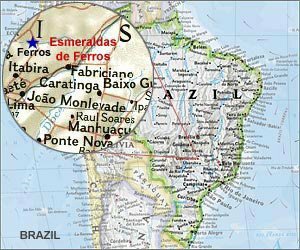 Most famous chrysoberyl deposits, spread throughout the 1,800 hectares of the Faísca and Crisolita Basins. The cat's-eye chrysoberyl is about 30 percent of the rough found , although only 10 percent of that is good color. 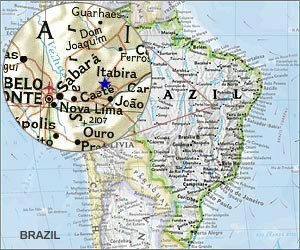 Few years ago, Brazil's environmental agency (IBAMA) shut down the Duarte & Bastos's mine for polluting the local stream and deforesting the region, which can cause serious erosion problems. Now, with only a dozen or so miners left, they're allowed to mine on a limited basis while they implement a 20-year plan to replenish the vegetation and build dams to remove soil sediment from the water.